Our "Roll of Honor" has been established to recognize the tens of thousands of men and women, living or deceased, and employees on the railroad, interurban and city street railways, and railroad related industries, who contributed so much to our Western New York Railway Heritage. For a $100 donation, a plaque will be mounted on a permanent display board in the Heritage DiscoveRY Center, Buffalo, New York, bearing the name, occupation, railroad (industry) and years of service. Your donation will be applied toward our continuous preservation efforts. 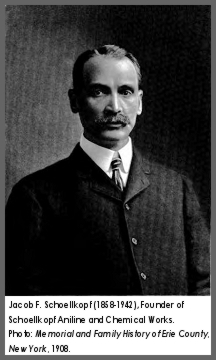 This month the Western New York Railway Historical Society is honored to add Mr. Joseph Frederick to its "Roll of Honor." Following are Mr. Frederick's own words on his career. "I worked as a trainman for 15 years (1955-1970). My principle route was the Bridge Pickup out of Manchester, New York to the Suspension Bridge Yard in Niagara Falls, New York. I passed the Williamsville depot many times. I so enjoyed my years on the railroad! 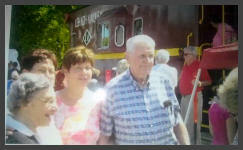 This picture was taken at the caboose dedication in Manchester, NY. on August 25, 2013. Pictured are my wife Ann, daughters Marie and Joanne and myself, Joseph Frederick." Thanks to Cal Bulman for nominating Mr. Frederick to the "Roll of Honor." If you would like to honor one of your friends or relatives who work or have worked on a railroad, or even for any of the industries that supplied the railroads, please print out this Roll of Honor Application. It's a great way to remember and distinguish their part of railway history! This month we are pleased to add Mr. Joseph N. Weiss to the WNYRHS "Roll of Honor." Mr. Weiss hired on with the New York Central in June of 1965 as a fireman on the extra board. He did this as a summer job while attending college, which allowed him to earn money while giving time off to more senior employees to enjoy summer vacations. He worked every summer, school breaks and weekends from 1965 until 1973. When he wasn't working on the railroad, Mr. Weiss was attending college and eventually received degrees from St. Bonaventure University and Canisius College. As it turned out he passed his engineer's exam the same week he received his Ph.D. from the University at Buffalo. Mr. Weiss says, "In truth, the experience of railroading with so many different crews of individuals provided a greater education than any classroom. Maturity and responsibility came quickly for the kid from the Tiorunda Projects in Cheektowaga." Thanks go to Max Weiss for nominating his father to the "Roll of Honor." This month, The Western New York Railway Historical Society is honored to add Mr. David E. Coffed to the Railroad Roll of Honor. Mr. Coffed hired on with the New York Central as a fireman in 1965. In 1976 he was promoted to engineer and saw service between Buffalo to Syracuse, Albany and Binghamton. Mr. Coffed also worked five years for Amtrak as a fireman. He witnessed the transition from New York Central to Penn-Central to Conrail before retiring in 1998. We thank Mr. William Coffed for placing David on the Roll of Honor. Marty Phelps passed away unexpectedly at the age of 75. Many of us knew him as the founder and "face" of the Medina Railroad Museum. However, he was much more than that. He was passionate not about only railroading but also the military, firefighting and the police. His respect for these professions and the people that served in them was profound and was reflected in his desire to remember them and show their importance by making them part of his vision of a museum that encompassed all of those professions. He wanted people to see, remember and appreciate the sacrifices and the time these professionals spent at their jobs and efforts that were made to keep us safe and healthy. He wanted people to know what it meant to be a railroader, a firefighter, a soldier or a policeman. memorabilia. Marty enjoyed life and his greatest joy was talking to people. It was a skill that allowed him to talk to anyone and make them feel as if they had been friends forever. Marty aimed high in whatever he did. As a long time firefighter for the City of Batavia he created the "Lives are Precious" Fire Prevention Program, which stressed the importance of fire safety designed especially for children. Marty felt strongly about utilizing actual photographs of burns in his program, as graphic as they might have been, this was the reality of what damage fire can cause and what can happen if safety precautions and respect are not used. The intention was to, hopefully, deeply instill a healthy fear of and respect for fire. He worked as a fire investigator and traveled widely to schools and volunteer fire agencies with his "Lives are Precious" program. Fire trucks from nine different locations were present in his funeral procession. That was the impact this man had on others. Marty was also so veteran of the Army. He served in Germany and, as with his childhood, loved to re-gale people with stories of his years driving big rigs and other adventures, some of which are probably better left unsaid. His respect for the military is reflected in the current Medina Railroad Museum where there are dis-plays of highly detailed naval vessels and a complete Army train running on the layout. He had big plans for running trains to benefit local Armed Forces organizations. Marty's love of the railroad originated as a young boy with his grandfather and Uncle Earl as employees of a railroad and collectors themselves. Marty's collection goes well beyond the walls of the Medina Railroad Museum. His favorite railroad was, hands down, the New York Central and when he was finally able to do so he painted the museum's fleet in the 1948 Century color scheme. His vision was to see the museum's two ex-NYC E-8s pulling a dinner train that reflected the grandeur of the Twentieth Century Limited. Many people over the years scoffed at Marty's ideas but he had a way of making them happen. Of all the things Marty was and all the things he loved, nothing was more important to him than family. His family topped his list of important things and it showed in the way he cared for them and did for them. The museum was not just intended as a legacy for Marty and his entire family but also to those who donated their collections to the museum. Marty wanted everyone to be able to enjoy seeing the beauty of our history on display and felt strongly about the Medina Railroad Museum being a place to assist in educating our children. Marty left us before many of his goals were accomplished but he left a legacy of passion and vision that the current Board of Trustees has vowed to see through! The Medina Railroad Museum and Marty Phelps will be around for a long, long time. Rest in peace my friend. Your legacy is secure. The Western New York Railway Historical Society is pleased to be able to add Mr. Kenneth Wylie to the Roll of Honor. Mr. Wylie hired on with the Erie Railroad in 1955 and worked his way up to conductor. He stayed with the railroad through it's merger with the Lackawanna, into Penn Central and left railroading in 1990 as a Conrail employee. Mr. Wylie was known for his generosity in helping others by purchasing items both large and small to help them through their lives while asking nothing in return. Welcome aboard! Our thanks to Mark Klepadlo for making the arrangements to have Mr. Wylie placed on the Roll of Honor. Linda came to Medina in 2001 after she met Marty Phelps, the founder of the museum. They met in California when Marty was visiting there and after a long distance relationship she moved back to New York. Linda was born in Troy. She fell in love with Marty and his vision of a railroad museum but felt it needed a woman's touch, which she gave it and so much more. She joined the team in Medina and wore many hats but officially she was the Director of Promotions. It was Linda that brought Thomas the Tank Engine to the site. That was ten years ago and it was still a money maker this year. Linda had a background in marketing and business management and she used those skills along with her passion to bring together a cohesive group that spawned many successful excursions and really kicked efforts at the museum into high gear. Linda was a perfectionist, detail oriented, hardnosed at times and demanding at times. I know because we clashed on occasion but we always ended any dispute with agreement, compromise and a hug, literally.. When not performing her promotions duties she could be found working on the museum's layout or cleaning the coaches. Nothing was beneath her if it needed to be done and she brought a perfectionist's attitude to everything she did. She had a real artist's touch with scenery and much of what you can see today on the museum's layout is the result of her skills and patience. Besides all her many skills, Linda was fun. She had a wonderful sense of humor that made the excursions we did together even more enjoyable. Her harder business side was balanced by a warmand caring personality. She cared about people and people that really knew her cared about her. You could not help it. We are never ready when someone we care about leaves us. 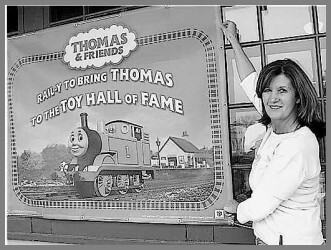 Linda passed away just before the Thomas event in 2011. Per her wishes the event was completed but it wasn't the same. She left behind a legacy that survives at the Medina Railroad Museum and in the hearts of those that knewher. She was one of a kind, my friend and I miss her. It was a great honor for me to be able to write this article and welcome Linda to the Roll of Honor. Jacob Frederick Schoellkopf Jr. was born in Buffalo New York February 27, 1858. In his boyhood he attended the city public school and later studied at St. Joseph's College. Upon graduation he went to Germany where in the seven years from 1873 to 1880 he pursued a strenuous course of study at Munich and Stuttgart. At the later place he made a specialty of chemistry, graduating from the Polytechnic College in Stuttgart in 1880. In 1879 Mr. Jacob Schoellkopf Sr. (1819-1899) (tannery and Hydro Electric power) the father of the person to which this story is about established for his sons Jacob Jr. and C.P. Hugo, the Schoellkopf Aniline Chemical Company. Jacob Jr. At the close of his university career in Germany, Mr. Schoellkopf returned to Buffalo and engaged in the business with his brother. His chemical studies had directed his attention to the subject of coal tar dyes, and he had arrived at the conclusion that the American market offered a great field for these products which constitute the most extensive plant of this kind on the continent. The company developed a good reputation with the textile industry and soon found it necessary to build several branch operations in New York City (1880's) and Philadelphia ( 1893). 1900 saw the uniting of the branches under the new name Schoellkopf, Hartford & Hanna. Company had 350 workers on the payroll. There were thirty brick buildings on forty-two acres of land. The company had superb shipping facilities and unequal special equipment. Early attempts to manufacture dyes were thwarted by stiff German competition, but the business grew on the basis of imported dyestuff and organic chemicals. The company became a leading producer in the U.S. by the outbreak of World War I. A major step in the development of the U.S. industry occurred in 1917 when National Aniline and Chemical Company, Inc. were formed by the merger of Schoellkopf Aniline and Chemical Company and a few others. The new company represented a highly integrated approach to dye manufacturing beginning with coal tar crudes and intermediates. It also had 75% of the market and was able to compete with foreign markets after the WWI. After the war synthetic indigo was made for the first time. "Aiizzarin" was in high demand do to their resistance to fading. In 1920 "Zambesl Black Dews" was discovered. This was a closely guarded secret of the Germans. In 1921 National Aniline & Chemical Company combined with four other companies to form Allied Chemical & Dye Corporation. The plant produced over 1,000 different dyes and organic chemicals. During the 1920's, diversification and new commercial ventures were the norm with new discoveries. Likewise during the 1930's and WWII. 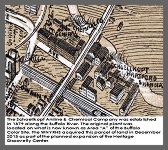 In 1977 Buffalo Color purchased the plant now known as the Allied Chemical Corporation. Subsequently, it was sold to South Buffalo Development LLC and most recently to the Western New York Railway Historical Society. This site will now be known as the "Heritage Discovery Center", a campus recognizing Buffalo's rich and diverse history. Mr. Jacob Schoellkopf Jr. we thank you profusely for your interest in the chemical industry which made what is happening today and the years to come possible. As our first inductee for 2014 the WNYRHS is proud to welcome, Carl A. Imbert to the Roll of Honor. Mr. Imbert was born in 1924 in Hazelton, Pennsylvania. His father was a coal miner. 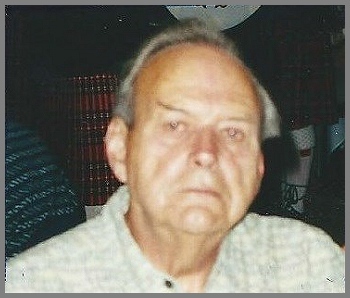 Carl moved to Niagara Falls, NY and after completing his military service as a member of the Military Police he hired on with the Lehigh Valley Railroad in 1948. His job allowed his family to move up to the middle class. Mr. Imbert's job as a mechanic took him to some unusual places, including the top level of the Whirlpool bridge on a cold dark February night. According to Mr. Imbert's son Paul who provided the information for this article Mr. Imbert was equally chilled by the biting winter wind and the knowledge that the water was somewhere far below. At the other extreme Mr. Imbert once responded to his fellow railroaders' complaints about an especially hot summer by showing up at work wearing his warmest winter clothing. While Mr. Imbert's career spanned a healthy 37 years it was cut short when he retired at the age of 62 to care for his ill wife. Prior to this he would often come home at lunch to care for her. He cared for her until she passed away in 2013. Throughout that time, even though his health was also failing and he needed some support from his children, he remained the strong father, husband and caregiver that seemed to define his life. Paul described Mr. Imbert by saying, "He has a heart of gold was as strong as an ox both physically and emotionally as well as mentally." The last line of Paul's biography of his father states, "Carl is a real champ. A hard worker, a great caregiver he was for my mother and a great provider. If there is a "Roll of Honor" anywhere he should be on it. His 37 years of mechanical skills and dedication should be marked in history." The Western New York Railway Historical Society is honored to be able to add Mr. Imbert to its Roll of Honor and guarantee his place in local railroad history, which he so richly deserves. My thanks to Mr. Imbert's son Paul for the information for this article and making the nomination for his father.